letter dated 17 November 2016 from NFNPA to LUC (the Forestry Commission’s agents): Decision Notice. letter dated 27 October 2016 from FoL to NFNPA regarding late amendments to the Planning Application. email dated 7 October 2016 from NFNPA to FoL regarding the date when the Latchmore Planning Application will be considered by the Planning Development Control Committee. letter of 9 August 2015 from FoL to NFNPA regarding unanswered questions. 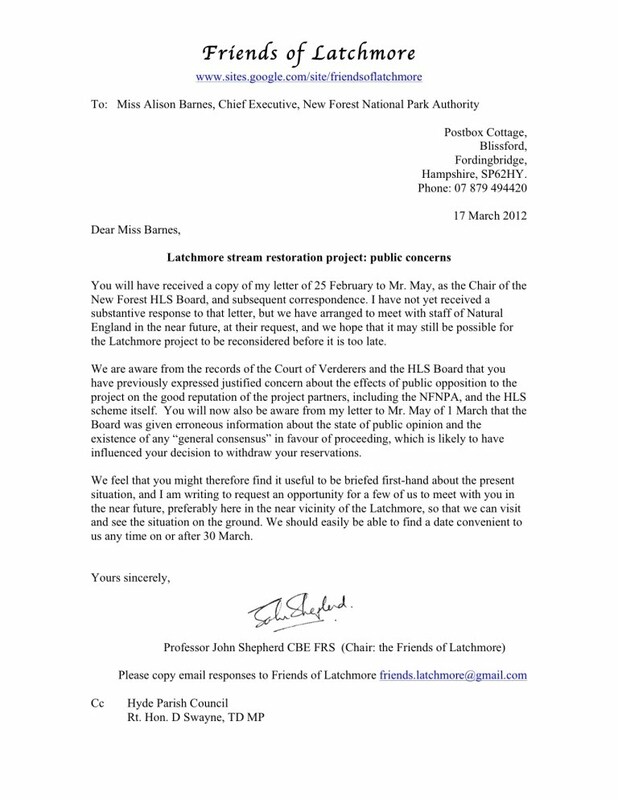 letter and email of 14 September 2014 from Friends of Latchmore to NFNPA commenting on the EIA scoping report for the Latchmore Brook Restoration Project. letter of 25 July from NFNPA to Buxtons regarding Planning Permission for work in North Slufters. letter of 6 June from NFNPA to Buxtons regarding the need for an AA. email of 20 May from NFNPA to Buxtons (received by Buxtons on 25 July) regarding a FOI request. email of 6 March 2014 from NFNPA regarding the need for an Appropriate Assessment. letter of 16 August 2013 from NE to NFNPA regarding the need for an EIA. letter of 26 July 2013 from NFNPA to NE regarding the need for an EIA. letter of 20 December 2012 from NFNPA to FC detailing their screening opinion regarding the need for an Environmental Statement.